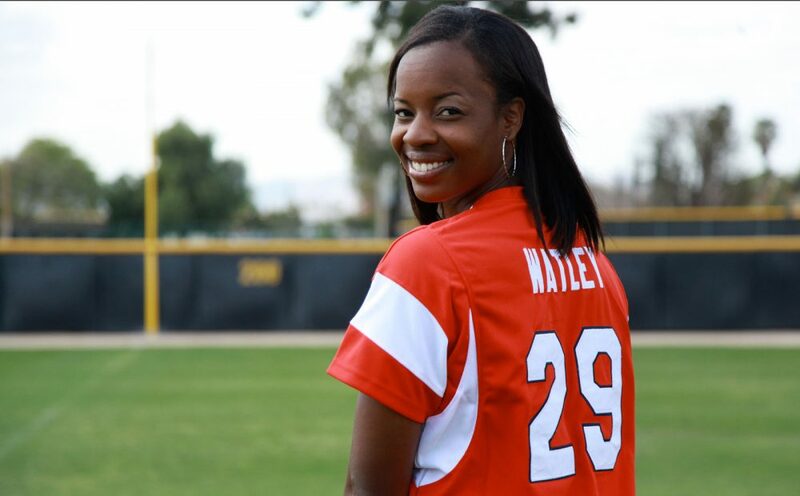 Natasha Watley has won as a team member the gold medal for softball at the 2004 Summer Olympics in Athens and the silver for the Beijing Olympics for USA. She is two –time Pan American Gold Medalist (2003 & 2007), three-time World Champion (2002, 2006, 2010), and a four-time World Cup Champion (2006, 2007, 2009, 2010) and has also won numerous other awards. 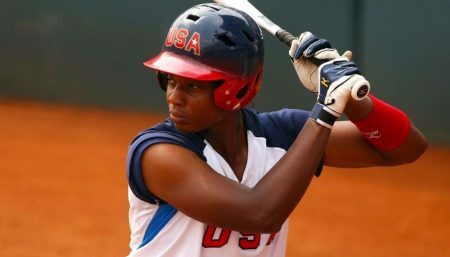 She is the first African-American female to play on the USA Softball team in the Olympics. She was born on 27th November 1981. She is an American, former collegiate 4-time First Team All-American, left-handed hitting softball player for the UCLA Bruins and USA Softball Women’s National Team originally from Irvine, California. She plays the position of shortstop and first base, and helped the Bruins win a national championship. She owns numerous records for the Bruins and is one of select players to bat at least .400 with 300 hits, 200 runs and 100 stolen bases. Watley played her first season professionally with the New York/New Jersey Juggernaut in the National Pro Fastpitch league in 2005. In her rookie season, Watley led the Nauts in batting with a .374 average and tallied 37 hits as the leadoff hitter to be named an NPF All-Star. In 2006, Watley played for the Philadelphia Force in limited action (30 at-bats) due to Team USA duities. 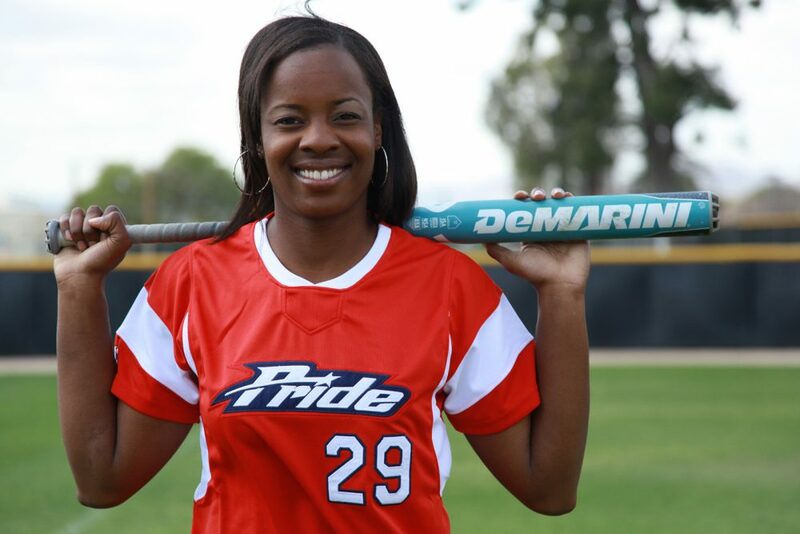 Today Watley plays for the USSSA Pride based out of Kissimmee, Florida. In the 2010 season, Watley received her second All-NPF Team honor and her team made it into the Cowles Cup Championship on August 29 vs. the Chicago Bandits. Watley hit a solo home run in a 3/4 performance against pitchers Kristina Thorson, Nikki Nemitz and Jessica Sallinger to win the title. For the 2011 season, she led the league in average at .459 and was able to get a rematch shot at defending her team’s title on August 24. The Pride lost but Watley had two hits and batted in two of three runs off ace Monica Abbott, pitching for the Bandits. In 2012, Watley was second overall in batting average and had a rematch in the Cowles Cup Championship with the Chicago Bandits and Monica Abbott. They lost again on August 25 at a 2-1 score, but Watley managed a hit in the effort. For the 2013 season championship, Watley earned the Cowles Cup Championship and had a hit in the finale. Watley set a league record for hits in 2011 that still stands. She also holds the career batting crown for playing multiple season and ranks third in stolen bases. The streak of three First Team All-American and All Pac-10 honors continued as the junior also broke the school record for hits in a season (112), which also led the NCAA Division I. Her triples and stolen bases were second best all-time, while her career-best .485 average ranked 4th (5th all-time) at UCLA. Notching her second-longest streak, Watley began a 29-consecutive-game hit streak on February 1 until March 9. Watley hit .543 (56/103) and had 24 RBIs, two home runs, three triples and 7 doubles. She also had a slugging percentage of .747% and overall her streak was 6th best for the NCAA. Watley was named to the WCWS All-Tournament Team, hitting over .450 for the Bruins. Again earning a place on the All-American team, she added the 2003 Pac-10 “Player of The Year” and the Honda Broderick Cup for “Best Collegiate Female Athlete” and “Best Collegiate Softball Player.” Watley ranked top-10 in school season categories of batting average, hits, on-base percentage and stolen bases. From January 31 to February 31, she had her third-longest hit streak at 19 consecutive games. She hit .500 (30/60) with 21 RBIs, two home runs, a triple and 4 doubles. On April 30, Watley batted in a career-high 5 RBIs on two home runs to defeat the Washington Huskies. At the year’s WCWS, Watley was again named to the All-Tournament Team, batting over .400 with 3 RBIs and slugging over .550%. The Bruins made it into their third finale with Watley and claimed the no-hit win over Kelly Anderson and the California Golden Bears on May 26. Watley went 2/5 with a triple. In her four years as a starter for the Bruins, she finished tops in career hits, triples, runs and stolen bases. She ranked second in career batting average (.450) and top-10 in doubles, slugging and on-base percentages. Watley holds the single-season record for hits (112) and is currently ranked fourth in Pac-10 history. Watley is listed seventh on the all-time NCAA record books with 115 hits in a single season. She was also the first UCLA Bruin to have two 100+ hit seasons.